Dust in the air can be a great danger to our respiratory system. 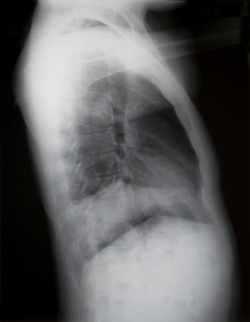 Silicosis is a lung disease that can occur after being exposed for a longer time to dust containing quartz (eg. concrete). Recent studies have also determined the connection to lung cancer. Which occupational groups are exposed to the hazard of silicosis? Silicosis occurs especially with miners and labourers in quarries or with people working with natural stones. Also in the construction industry has the risk to develop silicosis (the black lung - as you can see on the picture) increased. This is due to the increasing use of more powerful grinding and milling equipment within concrete work, which release a large amount of very fine dust. The silica particles have a size of ca. 0.5 µm and pass easily into the deepest recesses of the lung, where they are deposited. The human body reacts to these foreign objects with the so-called “antigen-antibody reaction”. This leads to a decay of the lung tissue with subsequent scarring as the silica particles bond into islands in the lung tissue. Over time this leads to a reduced lung function, disability and even to lung cancer. The latency period can be up to 10 to 20 years before the first clinical symptoms are shown. Various studies have indicated that the crystal forms of tridymite and cristobalite quartz are more dangerous than ordinary quartz. These occur only in certain regions, but they can be released by heating ordinary quartz. If you cannot avoidworking with quartz components and the resulting dust (unavoidable in construction industry), the only prevention against silicosis is to force the use of source extraction via tools equipped with appropriate suction casings and powerful and effective dust extraction using the highest possible level of filtration. This procedure, extracting the dust directly at its source, is called source extraction. Today most serious tool manufacturers products can be equipped with suction casings and connection to a dust extractor. The dust extractor should preferably be built around the cyclonic principle and be equipped with both a fine filter and a micro/HEPA filter. As the dangerous silica particles are so small and are carcinogenic the dust extractor should fulfil class H (EN 60335-2-69) and have a filtration level of 99,995% to prevent silicosis and lung cancer.